Characterization of chemicals released to the environment by electronic cigarette use (ClearStream-AIR project): Is passive vaping a reality? 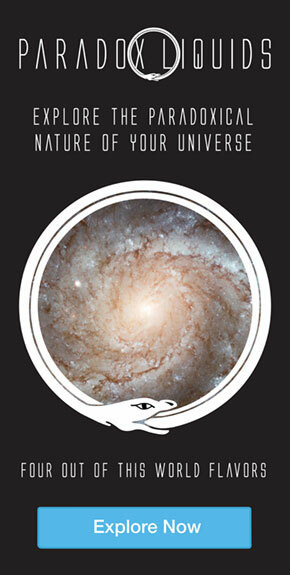 See the full study here. The study was conducted by G. Romagna MD, L. Zabarini, L. Barbiero, E. Bocchietto, S. Todeschi, E. Caravati, D. Voster from ABICH S.r.l., biological and chemical toxicology research laboratory in Verbania, Italy; and K. Farsalinos MD at the Onassis Cardiac Surgery Center in Athens, Greece. The following study was conducted to learn more about the effects of side stream (secondhand) smoke/vapor and air pollution caused by both traditional cigarettes and electronic cigarettes. To test traditional cigarettes versus electronic cigarettes and determine the amount of matter released into the air by each, the experimenters used a 60 mᶾ closed room without renewal of indoor air to ensure accurate readings. The room contained several different air sampling systems, each of which sampled for a different form of matter. In the experiment, two sessions were recorded. The first session was for traditional cigarettes; and the second was for electronic cigarettes. In this first session, five smokers were allowed to smoke however many cigarettes they had the urge to smoke for a total of five hours. The room was ventilated for 65 hours before the second session started. In the second session, 5 vapers were allowed to vape however often they pleased for a total of five hours in the same room. Total Organic Carbons (TOC) – Can be classified as neither toxic nor non-toxic, these are just a measure of the amount of carbonic matter found in air. Carbon Monoxide (CO) – Colorless, odorless, tasteless gas which is toxic to humans and animals in large amounts. Glycerine – non-toxic, colorless, odorless liquid used in foods and beverages as a humectant (moistener), solvent, or sweetener. Acrolein – toxic, and a strong irritant for skin, eyes, and nasal passages. Glycerine is converted into Acrolein when combusted. Here are the results recorded at the end of each 5 hour session. These results not only show the effects on air of a closed space caused by each of the two choices, but also the toxicity of the respective cigarettes. 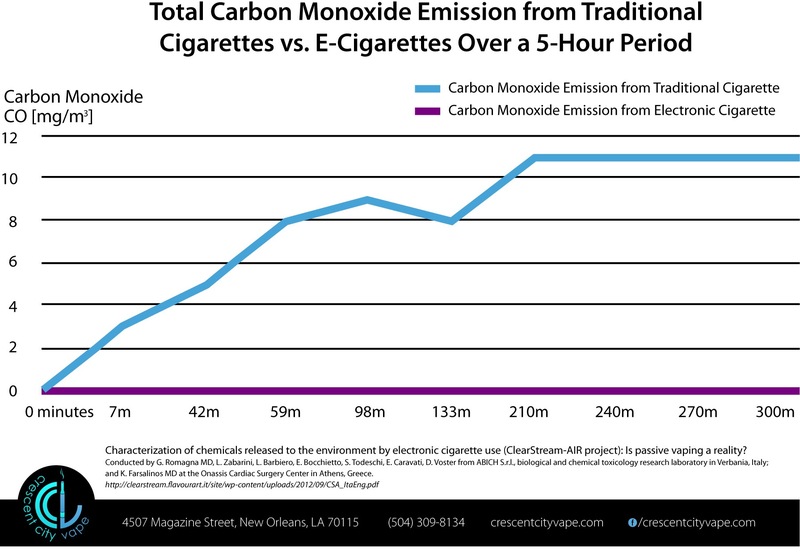 As clearly displayed in the graph above, carbon monoxide production is literally infinitely greater from tobacco cigarettes (11 mg/mᶾ) than electronic cigarettes (0 mg/ mᶾ). Additionally, traditional tobacco cigarettes do not produce glycerine, whereas electronic cigarettes do. Glycerine is used to keep tobacco moist in an un-burnt cigarette. It’s also a common ingredient in the nicotine e-juice for electronic cigarettes. However, glycerine actually is a non-toxic chemical used in a wide range of foods and beverages. Glycerine, when combusted (burned), is converted into acrolein, a toxic irritant to the skin, eyes, and nasal passages. This accounts for the lack of glycerine found in the air after the smoking of traditional cigarettes. Because combustion never happens in e-cigarettes, the glycerine contained in the e-liquids is never converted to acrolein, which accounts for the lack of acrolein found after the vape session. Overall this study demonstrates the vast differences in air quality resulting from cigarette smoke compared to electronic cigarette vapor. The researchers of this study compared these results to an array of studies that tested urban air pollution. They drew the conclusion that it is unhealthier to breathe air in big cities than it is to breath air in a room in which someone is vaping.